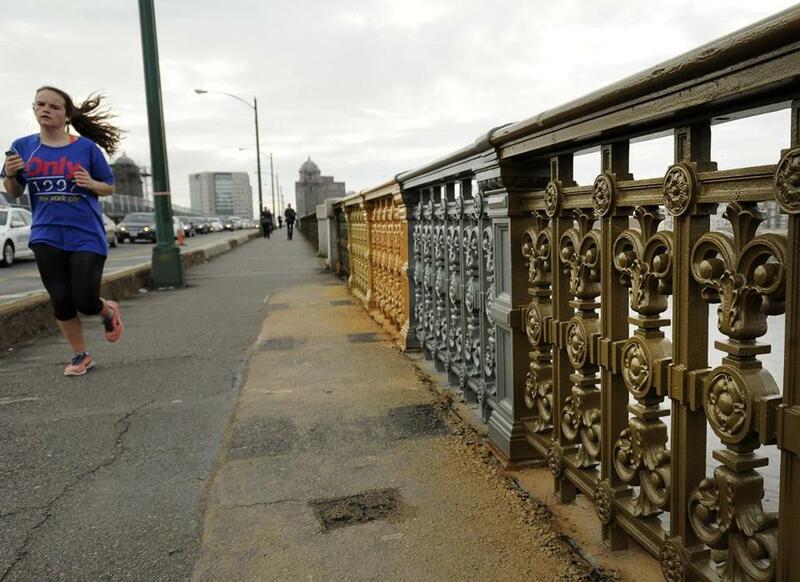 A team of local and state officials are testing out paint colors on Longfellow Bridge to determine which tints exactly match the original colors of the century-old structure. No home improvement project would be complete without splashing some paint samples on the wall to see what looks good. That’s the thinking behind the psychedelic colors that have appeared on the sidewalk railings on the Boston side of Longfellow Bridge, which (haven’t you heard?) is in the midst of a three-year, $255 million construction project. On most of the bridge, the railing remains the same sickly green-tinged rust that we’ve seen for years. But close to the end southeastern end of the bridge, stretches of the rail have received a new coat of paint: specifically, FS 24165, FS 33105, FS 33440, and FS 33245. These aren’t just any random paint colors picked out at Home Depot. It turns out that, for decades, the federal government has had its own system of paint swatches, known as “Federal Standard 595” — that’s where the “FS” comes from. During World War II, the U.S. government ran into trouble when equipment subcontractors on the other side of the world struggled to get the exact right color. (It wasn’t cool to have a formation of fighter planes flying in 12 different shades of olive.) The federal government came up with a system of color swatches and matching reference numbers, which they distributed to manufacturers. The same system is still used today for government construction projects. Officials have been working to figure out exactly which color in the federal system matches the original paint that covered the steel, rib-like arches underneath the bridge and the ornamental ironwork above the bridge. It’s a decision that was made jointly by a slew of hue-minded observers: the state historic preservation officer, Boston Landmarks Commission, Cambridge Historical Commission, Department of Conservation and Recreation, the Federal Highway Administration, and MassDOT. That’s a lot of people looking at paint. For the steel arches under the bridge, officials chose FS 24165, gray with just a tiny tint of green. And for the iron sidewalk railings and sidewalk streetlight poles, the winning color was FS 33105, a bronze color that skewed more brown and less mustard-colored than its competing counterparts.